A few weeks ago, I jetted off to Europe with Bill (my BF + BFF) where we traveled to Lisbon, then to the Amalfi Coast, and lastly to Rome. If you follow BTFL on Instagram you may have been keeping up with our adventures via my Instagram Story updates. Because I had such a wonderful experience in all of these cities, I decided to write a travel guide post for each of them, starting with Lisbon! We stayed at The 8 Downtown Suites, in the heart of Lisbon. We could not have been happier with the accommodations especially for the price and location. The room was a comfortable size, with a stylish design and ample air conditioning (always a must in the summer). The hotel provided water, coffee, tee, cookies, and fruit 24/7 in the lounge. The staff were very accommodating and provided us with a quick map tour of Lisbon to help us get acquainted. Lisbon is a wonderful city with lots of shops, restaurants, and gorgeous viewpoints. Since the city is incredibly hilly, kind of like San Francisco, it's important to bring comfortable walking sneakers (I wore my trusty Adidas Superstars the entire trip). To get to some of the best lookouts, like Miradouro das Portas do Sol, featured in the cover photo of this blog post, you'll need to hike up some fairly steep streets, but it's definitely worth it! Sophia de Mello Breyner Andresen Viewpoint is another incredible vantage point and is featured in the photos below. You'll find that all of these "miradouros," which is Portuguese for "viewpoints," have kiosks where you can grab a beer or glass of wine to enjoy while looking out at Lisbon. Public transportation in Lisbon is extremely convenient! We took a simple bus ride to get to a part of Lisbon called Belem, where the Belem Tower is located (same goes for the Jerónimos Monastery discussed below). This historical fortified tower played an important role in the defense system, during the Age of Discoveries in Portugal. The line for this site was quite long, but what you might not know is that there are actually two lines -- one for people without tickets, and one for people with pre-paid tickets (which was much shorter). The trick is to purchase your tickets at the Jeronimos Monastery, where you can get a package deal if you buy the tickets for both historical site together. There's also a student discount! Like I mentioned above, Jerónimos Monastery is located in Belem and is only a bus ride away from the center of Lisbon. The bus drops you off just by the Monastery. You might see a long line of people waiting outside -- it'll look like they are waiting to enter the Monastery. These people are actually waiting in line to purchase tickets. Instead of waiting in that line, head over to the other entrance (the one that looks more like a museum entrance). You'll see an information desk with a shorter line of people, where you can purchase tickets to the Monastery (and Belem tower). This then allows you to skip the large line outside and walk right in! Also there's a student discount so be sure to bring your ID if you have one. Just a ~45 minute train ride from the center of Lisbon, is the coastal municipality, Cascais! Among the cute shops and beaches, there's also what seems to be a never-ending bike trail with gorgeous view points along the way. It's a must see! Another train will take you from Lisbon to a different municipality, Sintra, in just about an hour. This city is filled with marvelous castles dating back to the 19th century. Portuguese royalty built these places as a getaway, and what a getaway it must have been! With too many castles to see in one day, Bill and I set out to see just two, Pena Palace, and Quinta da Regaleira. Pena Palace is a very colorful palace at the top of a mountain, so it features some incredible views among the interesting architecture. Quinta da Regaleira, has a more gothic build, and features some impressive outdoor gardens and wells! Below you'll see some photographs of me taking the steps down to the bottom of one of those wells. As you might except, it's best to get to Sintra as early as possible, before it starts to overflow with tourists. After getting off the train, you should head to the closest information center to inquire about bus tickets (to get you around Sintra) and tickets for each palace. With some time in the day to spare, we purchased another bus ticket to take us from Sintra to Cabo de Roca (more info below). Cabo da Roca is the western most point in all of Continental Europe and is quite the site to see -- a nice change of scenery from all the castles in Sintra. It was about a 40 minute bus ride to get from Sintra to Cabo da Roca. Also, be sure to pack a sweater because it gets very chilly due to the wind! My favorite part of the entire trip was getting to eat the famous Pasteis de Nata everyday day. I probably had about 5 of these delicious egg-custard-filled-pastries each day I was in Portugal. Suffice it to say, they are now my favorite dessert. One thing to note is that while in Portugal, I never once had a "bad" Pasteis de Nata. Even the "worst one" that I had was still very tasty. That being said, my favorite spot for picking up pasteis in downtown Lisbon was Casa Brasileira. Their custard was incredible, their pastry puff was flaky, and best of all, their prices were unbeatable! However, if you're in Belem (mentioned above), then you'll need to stop by Pasteis de Belem, where the recipe for this dessert was born, and very well executed! *Just as a heads up, these pastries do not travel very well. The custard starts to make the pastry soggy after sitting in the travel box for an extended period of time. As you can imagine, the seafood in Lisbon was exquisite! We decided to dine at one of the top 10 rated restaurants in Lisbon called Sea Me. As a lover of sushi, I was very impressed with the high quality fish that was served there. Additionally, the pairing of fruit, herbs and seafood, was tastefully done. What's more is that the prices were very reasonable! 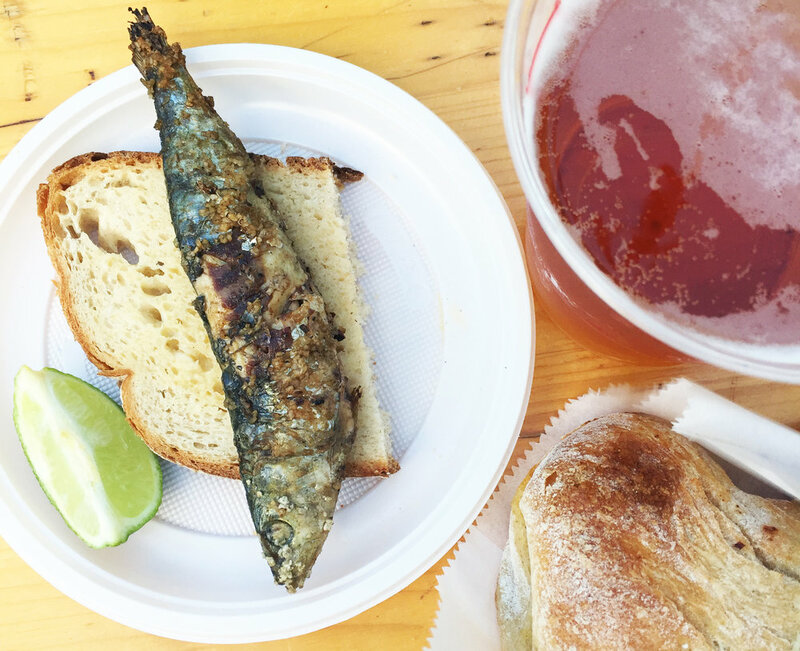 I'm not sure if you've heard, but freshly grilled sardine served with bread is a popular dish in Portugal. For this reason, when we stopped by a pop-up food market in Lisbon, I decided to give this dish a try. By the looks of it, I didn't think I was going to enjoy it. However, I was pleasantly surprised at how tasty it was! Also to my surprise, this is a "finger food" -- you have to use your fingers to pick away the meat from the bones. Overall, I ended up really liking it! Moral of the story, don't knock it until you try it! Hope this little travel guide is of some help to you if you find yourself in Lisbon! If you have any questions, please feel free to comment below or contact me here.